With melodious guitar riffs, driving rhythms and smooth vocals to tie it all together, Drowners is a band on the brink of dominating the indie rock music scene. Following an extensive international tour in support of their debut album, Drowners’ follow-up record, On Desire is now available for pre-order and will be released internationally on June 24th, 2016 via Frenchkiss Records. 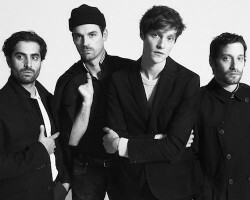 When describing the sound on their new album, lead singer Matthew Hitt explained it as this: “If the first record was about us roaming around downtown bars, discovering NYC, then this one is more reflective… think of us locked in a dark room wondering what the hell’s going on outside.” Fans can expect a darker side of the band this time around, and their first single, “Cruel Ways,” reflects just that through its introspective lyrics and melancholic mood. In their official interview with Noisey, Drowners describes this record as a true collective effort, showing their growth as a band from their formation back in 2011. The first single off the album, “Cruel Ways,” instantly hooks the listener through its hypnotic guitar melody and walking bass line, as lead singer Matthew Hitt croons about unrequited love. So if you’re in the mood for some authentic indie rock, pre-order On Desire and get hooked to the hypnotic guitar and walking bass line of “Cruel Ways.” And if you’re going to be at SXSW next week, check them out live during their several shows in Austin!